Yemen is the poorest country in the Middle East, with 80% of its poor in rural areas. In spite of limited cultivable land, nearly two-thirds of Yemenis derive their livelihood from agriculture. An increasing proportion of land has been converted from food production to the growing of qat, and small farmers’ land holdings are getting smaller while the largest and wealthiest landowners’ holdings are increasing. Sixty-two percent of farms cover less than 2 hectares. In spite of a major role in agricultural production, women rarely have ownership rights to land and commonly relinquish inherited land rights to male family members. Land disputes are relatively common in Yemen because there is no system for authenticating land deeds and land documents, either formal or customary, and no national cadastre. However, both urban and rural landowners have a reasonable degree of tenure security with rights enforceable under either civil law or customary and Islamic law, respectively. Access to water, which is tied to land rights, is a common cause of land disputes, particularly in areas of water scarcity. Land scarcity is resulting in appropriation and sale of communal land, in some cases by sheikhs in violation of their fiduciary responsibility. Yemen faces a crisis in terms of water supply and water quality, with one of the lowest per capita water availability rates in the world (only 150 cubic meters per year) and pervasive groundwater contamination. This situation has made waterborne diseases the major cause of the high infant mortality rate of 53 per thousand. Ninety percent of water withdrawal is for agriculture. Surface and groundwater resources are communal property, which has led to less than optimal use of this very scarce resource. Forests constitute only 1% of Yemen’s total land area. However, forests are a critical resource, providing 70% of the country’s energy needs and over half the fodder for livestock. In spite of forests’ economic significance, Yemen does not have a national forest policy or legislation governing forest land. The ownership status of most forest land in Yemen is ambiguous and disputes are frequent. One of the major current sources of Yemen’s national income, oil, is projected to become exhausted by 2012. Accordingly, Yemen can no longer rely on oil revenues and must instead continue to focus its development strategy on sustainable and productive use of its natural and human resource base. Productive land in Yemen is increasingly concentrated in the hands of a small number of wealthy families, reducing the rural and urban poor’s access to land. Factors leading to the change in land distribution are broadly articulated, but few if any comprehensive and systematic studies of the changes in land access patterns exist. Donors should help fill this large gap in knowledge by supporting such a study. Based on the study results and drawing on its knowledge of the region and comparative countries, the government could request assistance for mechanisms and programs to improve land access for the country’s rural and urban poor, thus helping the government achieve its stated objectives. Yemen’s formal court system faces significant challenges, functions poorly, and is less accessible to the rural poor and women. As part of its decentralization initiative, Yemen has assimilated some of the traditional leaders into the government system, a process that has in some areas weakened the effectiveness of traditional dispute resolution forums. As a result, residents in some areas have no effective and fair forum in which to seek enforcement of their land and water rights. USAID in particular has been working with the government and court system on capacity-building within the judiciary and has a good foundation to be the lead donor for an in-depth assessment of Yemen’s formal and informal land and water dispute resolution systems, offer recommendations for enhancing their capacity and effectiveness, and pilot dispute resolution programs in several areas. Women have responsibility for most of the work on agricultural land yet have limited rights to the land and are often excluded from the educational and employment opportunities that could improve their economic security and social position. Women from economically disadvantaged households and women-headed households should be prioritized for land access and development programs. Donors should consider developing a thematic, multi- country project that focuses on the issue of women’s land inheritance under Islamic law in several countries that have a high percentage of Muslims, such as Yemen. The objective of such a project would be to construct land-related interventions designed to address the commonly observed decision of Muslim women to relinquish land rights in favor of the promise of security by male relatives. Yemen does not have a legal framework governing forest land and forest resources – resources that are critical to the livelihoods of Yemen’s poorest households. Donors should assist the government to collect work conducted to date (including the FAO’s prior work in Yemen with community-based forest management), identify and convene stakeholders, and provide technical assistance in the development of a policy and legal framework. The Republic of Yemen is the result of the 1990 unification of the former Yemen Arab Republic and the People’s Democratic Republic of Yemen. The country’s rapidly-growing population is composed almost entirely of Arabic-speaking Muslims, and Islamic principles inform the formal and customary law. Yemen is the poorest Middle Eastern country: just under half of Yemen’s population lives on less than $2 a day, and approximately 80% of the country’s poorest people are in the rural areas. Oil income provides an estimated 75% of government revenue and 90% of export revenues. At the current rate of extraction and absent any new discoveries, the country will deplete its oil reserves by 2012. Much of Yemen is harsh desert and rocky terrain. Water is scarce. Seventy percent of the population lives in rural areas, and agriculture supports the livelihoods of two-thirds of the population, yet only 3% of the land is arable. Only 1.5 million hectares of land is cultivated, with an increasing percentage of land converted from food production to cultivation of qat, a pseudoephedrine stimulant. The trend is toward a reduction in the amount of land held by small landholders in favor of increasing amounts of land held by the largest and wealthiest landowners. Women perform 75% of cultivation activities in Yemen, yet rarely have ownership rights to land and commonly relinquish inherited land rights to male family members in exchange for promises of security. Women’s economic status suffers from low agricultural wages, widespread illiteracy, exclusion from the formal non-agricultural labor market, and traditional religious and social constraints on mobility and employment. Yemen faces a crisis in terms of water supply and water quality. Yemen has one of the lowest per capita water availability rates in the world. Competition for water for domestic and industrial use is increasing, and withdrawals exceed renewable resources. Deforestation of upper watersheds, overgrazing, and changes in land use are degrading watersheds and negatively affecting the quality and quantity of water. Groundwater contamination is pervasive and shallow aquifers are becoming polluted. Fewer than half of the rural population has access to safe drinking water. USAID, the World Bank, and other donors have begun a US $90 million five-year (2009–2014) grant project to support the government’s implementation of its National Water Sector Strategy and Investment Program, which includes components to improve community-based water resource management and increase access to water supply. Yemen has a limited amount of forest land (1% of total land area), and the population’s demand for fuel and fodder for livestock exceeds the regeneration capacities of Yemen’s remaining forests. The country lacks a legal framework governing its forest land and forest resources. Yemen has reserves of oil, gas, and other minerals but most of the country’s mineral production is focused on the production of oil, gas, and limestone. Oil income provides 90% of export revenues. At the current rate of extraction and absent any new discoveries, the country will deplete its oil reserves by 2012. Yemen’s economic future has been highly dependent on its declining oil resources. The International Finance Corporation (IFC) has been assisting Yemen’s government in drafting a new mining law, policy, and regulations in an effort to develop the industry for the social and economic benefit of the population (IFC 2009). Yemen has a total land area of 528,000 square kilometers and a 2008 population of 23 million people. Seventy percent of the population lives in rural areas and 30% in urban areas, with most of the population (52%) clustered in the highlands in four western governorates. Yemen’s total GDP in 2008 was US $26 billion. 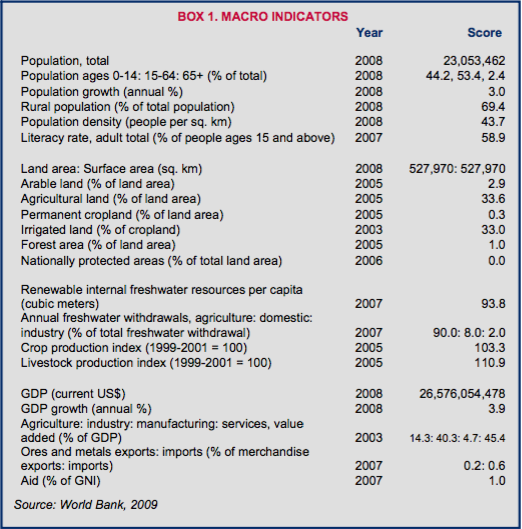 In 2003, 14% of GDP was tied to agriculture, 40% to industry, and 45% to services. Agriculture employed 50% of the economically active population in Yemen in 2000, supported the livelihoods of two-thirds of the population, yet contributed only 15% to GDP, down from 24% in 1990. The discrepancy between the percentage of those employed in the agricultural section and the contribution of agriculture to GDP reflects seasonal employment, underemployment, and low productivity of workers. Between 35% and 48% of Yemenis live below the national poverty line; 75–83% of Yemen’s poor live in rural areas (World Bank 2009a; FAO 2008; World Bank 2007; Ma 2008; ROY 2002a). Fifty-seven percent of Yemen’s total land area is desert. Thirty-four percent of Yemen’s land is classified as agricultural, but the vast majority of this land is pasture and range land. Only 3% of the total land is arable, and less than half of that (roughly 1.5 million hectares) is actually cultivated. One-third of the agricultural sector’s value is attributed to livestock, one-third to cultivation of qat (a stimulant leaf that is chewed on a daily basis by many Yemeni adults), and one-third to all other crops. One percent of the total land area is forest land, with no rate of deforestation reported (ROY 2002a; World Bank 2009a; FAO 2008; Aw-Hassan et al. 2000; World Bank 2003; ARD 2004). Yemen has a 3000-year history of clearing and terracing hillsides to conserve soil and water and increase crop production. The removal of vegetation, development of large-scale irrigation schemes, and lack of terrace maintenance over the last twenty years has caused soil erosion and the degradation of highland terraces. Yemen’s agricultural land and rangeland are deteriorating due to urban expansion, rapid runoff in wadis (seasonal riverbed valleys), excessive mining of underground water, drought, and sandstorms. In the last decade, 12 million hectares of agricultural land has been lost to soil erosion, 3.8 million hectares to salinity, and 3–5% of agricultural land is subject to desertification. Forests and natural sanctuaries are losing biodiversity due to overgrazing, overhunting, road construction, and firewood gathering (ROY 2002a; FAO 2008; World Bank 2003). In urban areas, the growth of unauthorized settlements is uncontrolled and they are spreading into wadi beds and up unstable slopes. Flooding and landslides are common, resulting in loss of life and destruction of property (World Bank 2003; ROY MPWH 2010). Yemen’s cultivated area is distributed among about 1.2 million landholders. Sixty-two percent of farms are less than 2 hectares; 4% of farms are more than 10 hectares. Roughly 60% of landholders have 2–5 plots; 8% of landholders have 10 or more plots. The trend is toward a reduction of the percentage owned by small landholders in favor of increasing amounts of land held by the largest and wealthiest landowners. Large landowners are often absentee, increasing the extent to which power, wealth, and influence are situated in the cities, marginalizing the rural population and limiting their opportunities to gain access to networks of influence (World Bank 2009a; World Bank 2007; FAO 2008; ROY 2002a). Women perform 75% of cultivation activities in Yemen, yet women rarely have ownership rights to land. Rural women perform about 80% of the work relating to livestock and often obtain rights to their livestock. Women’s economic status suffers from low agricultural wages, widespread illiteracy, exclusion from the formal non- agricultural labor market, and traditional religious and social constraints on mobility and employment (World Bank 2007; World Bank 2003; ARD 2004; ROY 2002a). The vast majority of Yemenis are Muslim and native Arabic speakers. The country has two small non-Arabic speaking communities: roughly 60,000 Mahri live in the desert bordering Oman and 80,000 Socotrans live on the island of Socotra in the Arabian Sea. Because of their physical and social isolation, these groups have less access to government support, investments, and infrastructure (World Bank 2007). The urban population is growing rapidly (5% annually nationally, 8% in some cities). Twenty-one percent of urban households live below the poverty line. Cities lack urban plans and resources to provide housing and services for the increasing urban population. Poor and low-income households squat on public land or join informal settlements. The living conditions are substandard: most settlements are on marginal land that is prone to floods and landslides; basic services such as water and sewer are not available; and they harbor disease and social unrest (ROY MPWH 2010). Thousands of refugees fleeing conflict and poverty in the Horn of Africa enter Yemen each year. The majority are from Somalia, although the country has seen a rise in refugees from Iraq, Ethiopia, and Eritrea. In 2009, Yemen had 155,000 refugees and another 150,000 internally displaced people (IDPs) seeking refuge from tension between the northern and southern regions of the country and clashes between the government and Al Houthis tribe in the Sa’ada region. Girls from these refugee and IDP populations are especially vulnerable to sexual violence and human trafficking (UNHCR 2010; Manea 2010). Ownership. Ownership is the dominant form of land tenure in Yemen; 82% of agricultural land is owner- cultivated. Landowners have the right to possess land, to use it as they wish, and to alienate it. Privately owned agricultural land is administered under customary law and almost always documented by a written deed or contract. An estimated 50–60% of urban residents have documentation of their rights to their plots (Aw-Hassan 2000 et al. 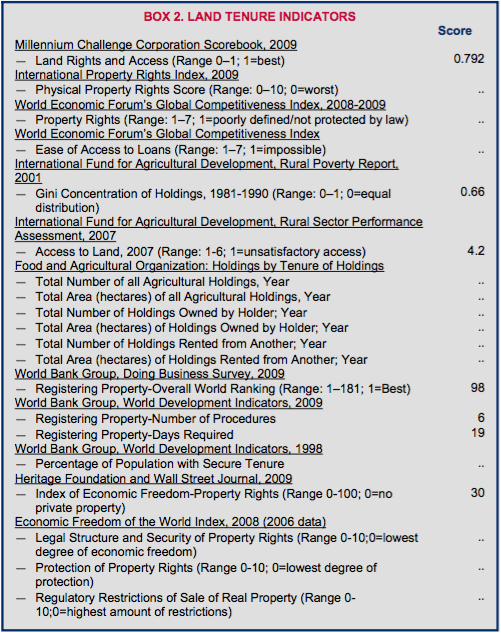 ; World Bank 2007; ROY MPWH 2010). Communal landholding. Law 21 of 1995 provides that communal land is owned by the state, and the state must manage the land in the interest of the people. In practice, communal land holdings are governed by the customary law of Yemeni tribes (urf). Grazing and range land is used and managed by communities, under the administration of their traditional leaders, sheikhs (Alabsi 2001; Aw-Hassan et al. 2000; ROY MPWH 2010). Leaseholds. Private, state, waqf, and communal land can be leased to individuals and entities on a cash basis. Leases tend to be for lengthy periods of time and are common on high-value irrigated agricultural land. Leases can generally be transferred, with permission of the landowner (Aw-Hassan et al. 2000). Sharecropping. Sharecropping is permitted on private, state, and waqf land, and is common on both irrigated and rainfed land. Sharecroppers have use rights for a contracted period and can bequeath their rights to their heirs. Shares paid to the landowner range from one-fourth to one-half of production, based on the community and on who has responsibility for inputs. Close relatives of the person who donated waqf land have priority for sharecropping (Aw-Hassan et al. 2000). Squatting. Urban migration resulted in large squatter and informal settlements in the industrial areas of most major cities and secondary towns in Yemen. The poor lack resources to obtain serviced plots and adequate housing in urban areas, and an estimated 65% of urban dwellers live in squatter and informal settlements. Squatters have no tenure security and are vulnerable to arbitrary seizures of the land for development (World Bank 2007; World Bank 2000). Most people, and particularly the economically disadvantaged, obtain land through the operation of Islamic inheritance laws and cash-based land leasing and sharecropping. Those with resources obtain urban and rural land through the land purchase market (Aw-Hassan et al. 2000; Mahdi et al. 2007). Foreigners can own land in Yemen and can execute land-based projects in Yemen. One law permits foreigners to hold 100% ownership interest in land while another limits foreign ownership to 49%. The government is reportedly reviewing the laws as an initial step toward resolving the inconsistency (USDS 2009). Rural and urban landowners have a reasonable degree of tenure security. Most rural landowners have documented rights to their land that are enforceable under customary law in traditional and formal tribunals. Urban landowners usually have registered land rights. Leaseholds and sharecropping agreements tend to be lengthy (10–50 years) and documented. Short-term agreements for use of land for a single season exist, usually for rainfed agricultural land. The use of form agreements creates some insecurity because forms, which often state that unspecified principles of customary law govern the relationship, do not provide details on responsibilities for the maintenance of the land, terracing, and reimbursement for investment (Aw-Hassan et al. 2000). The Republican Resolution on Law No. 39 of 1991 requires registration of land rights. However, only urban land appears to be registered pursuant to the formal law. Most private rural land rights are documented under customary law. Traditional leaders, usually the sheikh or amin, prepare land title documents (basira) and issue land inheritance certificates (fasl). The documentation usually includes a description of the land, boundaries, and history of ownership. Leaseholds are commonly documented in tenancy agreements (waraqat eyjar). The Ministry of Local Administration requested that the amin keep records of all land transactions at the sub-district level and recommended that the court endorse title deeds to ensure their validity. State land is recorded in the Land Registry Department at the Ministry of Finance (World Bank 2007; Aw-Hassan et al. 2000; Ecolex 2009). Registering property transactions in Yemen under formal law requires an average of 19 days, involves 6 procedures, and requires payment of 3.8% of the property value. Land may be titled individually or jointly in Yemen, but the vast majority of land is titled in the name of the male head of household or extended family. Women with individual title to land tend to be wealthy or educated urban residents (World Bank 2007; World Bank 2008a). Despite the efforts of a growing group of NGOs and activists committed to improving and protecting the rights of women and girls in Yemen, advancement has been slow. Only 29% of women in Yemen (compared to 70% of men) are literate. Many are restricted in their movement and activities, limiting their knowledge of their rights and their social networks. Islamic fundamentalism and prevailing cultural standards assign women subordinate status in their families and communities. Women have limited access to justice, and in most court proceedings, a woman’s testimony must be supported by a man (Manea 2010). Under formal law, women have a legal right to own, buy, and sell land in Yemen. However, customary law and traditional and religious practices prevail, and few women are able to realize their formal rights. Very few women, including women heads of household, own land. In some regions, women must obtain the permission of their husbands to transact land, regardless of ownership. Under the Personal Status Law, women who are divorced must leave the family house (Manea 2010; World Bank 2007). Under Islamic law, daughters inherit half the share of property received by sons. Women receive a one-eighth share of their husbands’ property and one-sixteenth of their sons’ property, should the sons predecease the mothers. In practice, women tend to transfer any land rights they receive through inheritance or marriage in exchange for economic support from their male relatives, such as rights to a house in the event of widowhood. Alternatively, some women make claims to moveable property such as jewelry (World Bank 2007; Manea 2010). Yemen’s Department of Public Domain, which resides in the Ministry of Finance, and the Ministry of Public Works and Highways administer urban land. The General Authority of Lands, Survey and Urban Planning (GALSUP) is responsible for: (1) urban and rural land inspections and surveys, layouts, and planning; (2) management of state, private, and wakf land; (3) administration and registration of land, including maintaining land records; (4) valuation of land; and (5) oversight of land expropriation. In practice, traditional leaders (sheiks and amins) continue to maintain authority over much of Yemen’s rural land, and many also hold local government offices and maintain the GALSUP registry of land records. The land registration process, which is a deed registration system, is considered inefficient, time consuming and untrustworthy. Cases in which one parcel of land is sold several times and other types of fraud are common; registration provides no assurance of good title. Only a small percentage of Yemen’s land (an estimated 10–20%) is registered. Eighty to ninety percent of land transactions occur by basira or informal documentation (ROY MPWH 2010; World Bank 2009b; Aw-Hassan 2000 et al.). Fertile land is extremely scarce in Yemen. As agricultural productivity suffers from water scarcity and land degradation, larger landowners are purchasing smallholdings from struggling small farmers. The prices paid for the land are not reported. In urban areas some regulations have reduced the supply of land and caused prices to increase by requiring large lot sizes and land to be reserved for traffic and recreation. In addition, the land market has been affected by foreign buyers and speculators reselling government land made available for low fees in the years following unification in 1990 (World Bank 2007; World Bank 2003; Mahdi et al. 2007). There is a trend toward increasing appropriation of communal land. Sheikhs are entrusted with management of communal land, and in areas of intensive land pressure, there have been incidents of sheikhs selling off communal land or transferring land for their personal use, in violation of their fiduciary role (World Bank 2007; ROY MPWH 2010). The Constitution provides that rights to private property be respected and protected; the state can expropriate land only when in the common interest, when absolutely necessary, and upon payment of fair compensation. The Public Eminent Domain Law of 1995 expands on the constitutional provision, providing that the state can expropriate land for vital projects (e.g., water sanitation installations, mining operations, airports, harbors, schools, roads, housing facilities). The government can take private land for vital projects only where it is deemed that there is no suitable public land alternative. The law recognizes several types of expropriation: administrative (between two administrative agencies), amicable (consensual and negotiated), judicial (upon showing of public interest before tribunal), temporary (e.g., needed for construction of public works), and expropriation for housing. The law provides for an administrative acquisition procedure with a judicial procedure for contested cases. GALSUP is responsible for setting property values for compensation (ROY1994; World Bank 2009b). Eighty percent of disputes in Yemen are land-related. The country does not have a system for authenticating title deeds and land documents (formal or customary), and no national cadastre exists, a condition that creates space for fraud and results in land disputes. Access to water, which is tied to land rights, is a common cause of land disputes, particularly in areas of water scarcity (World Bank 2007; ROY MPWH 2010). The majority of Yemenis do not seek resolution of land issues through the formal legal system. The formal court system requires a significant commitment of time and money and offers no guarantee of a fair result. The system suffers from inadequate administrative support, poorly trained staff, lack of appropriate education for the judges, burdensome caseloads, inadequate physical facilities, and widespread corruption. The system is also dominated by men, and rural women – 78% of whom are illiterate, their mobility restricted by cultural and religious norms – who are highly unlikely to use the formal court system (World Bank 2007; ROY MPWH 2010; Manea 2010; ROY 2002a). At least 70% of disputes are settled in the traditional forum operated by the tribal sheikhs who are responsible for managing communal assets and resolving disputes, including those related to land and other natural resources. The sheikhs apply customary law (urf or shar) and commonly use conciliatory dispute-resolution methods of consultation such as consensus-building, and mediation (World Bank 2007). As part of the government’s decentralization efforts, the Department of Tribal Affairs formalized the role of sheikhs, issuing many of them official identity cards. To some extent, formalizing the role of tribal leaders assimilated the customary system into the formal system, creating the potential for a single harmonized authority. However, the effort arguably weakened the traditional dispute-resolution system because communities lost their right to remove a sheikh from office. In addition, the sheikhs’ role within the government makes challenge less likely since residents and communities need strategic political connections. In some areas the sheikhs have lost their presumed neutrality because they stand to benefit from government land allocations and transfers to third parties (World Bank 2007). In 2009 and with support from the World Bank, the government of Yemen undertook an Integrated Urban Development Project designed to: (a) improve the living conditions of poor and at-risk populations and reduce environmental degradation in Sana’a and Taiz; and (b) develop a national integrated plan for urban development that is locally administered and includes support for squatters and residents of low income informal settlements while providing upgraded living conditions (ROY MPWH 2010; World Bank 2008b). In 2002, the Government of Yemen adopted a poverty reduction strategy that expressly recognizes the need to support the agricultural sector and improve women’s access to agricultural land. However the PSRP does not include any programs or initiatives to address land access and land tenure security for any groups, including women (ROY 2002a). USAID assists the government of Yemen in its efforts to strengthen its governance capacity, including the institutional development of local councils to support the electoral process and to mitigate tribal conflicts in rural areas and capacity-building for the judiciary. In 2005–2006, USAID conducted an assessment and developed a program focused on agricultural research and extension, women’s services and extension, integrated livestock activities, and horticulture marketing in five of the poorest governorates (USAID 2008; USAID 2005). Between 1997 and 2007, the World Bank, International Fund for Agricultural Development (IFAD), the United Nations Development Programme (UNDP), the Food and Agriculture Organization (FAO), Germany, the Netherlands, Abu-Dhabi Fund, and the Islamic Bank supported several agricultural projects in Yemen. For example, IFAD managed a 7-year, US $38 million project from 1998–2005, focusing on land development of off- farm opportunities, and community development in an effort to improve the standard of living for landless rural residents. None of the projects focused on women farmers and none operated in the five poorest governorates targeted by USAID. None of the projects or programs appear to have components addressing land access or land tenure security (USAID 2005; IFAD 2009). The Sisters Arabic Forum (SAF) works on women’s empowerment and improvement of women’s legal rights, including land rights in Yemen. The National Democratic Institute (NDI) and Islamic Relief are engaged in addressing rural tribal conflicts over access to natural resources, including land, through development of conflict mitigation procedures (NDI 2009; SAF 2009; IRW 2009). Yemen has a semi-arid to arid climate and faces a crisis in terms of water supply and water quality. Annual rainfall ranges from 67 to 93 cubic kilometers. The country has no permanent rivers; surface water is available from seasonal spate water and springs. High runoff and heavy rainfall in mountainous areas create deep wadis and form water basins. The country has four major drainage basins: the Red Sea Basin, the Gulf of Aden Basin, the Arabian Sea Basin, and the Rub Al Khali Interior Basin. Yemen has annual renewable water resources of 2.1 cubic kilometers. Withdrawals are exceeding renewable resources by 36% (FAO 2008; IDRC 2010). Degradation of Yemen’s watersheds, caused by deforestation of upper watersheds, overgrazing, and changes in land use, negatively affect the quality and quantity of water.Yemen has one of the lowest per capita water availability rates in the world: 150 cubic meters per person per year (compared to 1250 cubic meters in the Middle East/North Africa region), and the amount of available water per capita and access to piped water is decreasing. Competition for water for domestic and industrial use is increasing as the population grows and is increasingly urbanized. Ninety percent of Yemen’s water withdrawal is used for agriculture, 8% for domestic use, and 2% for industry. Irrigation efficiency is low, between 35% and 45% depending on field leveling and the water conveyance system used. Only half the urban population has access to public water supply systems. Less than half of the rural population has access to safe drinking water (World Bank 2007; FAO 2008; ROY MWE 2004). Yemen’s water quality is deteriorating. Groundwater contamination is pervasive due to industrial and residential waste and seepage of wastewater. Shallow aquifers are becoming polluted and coastal aquifers subject to saline intrusion. Groundwater used in public water supplies is not filtered. Well-water is contaminated with viruses and bacteria. In the poorest neighborhoods and villages, outbreaks of waterborne disease such as cholera, bacterial dysentery, typhoid, and infectious hepatitis are common. Seventy percent of infant mortality is due to waterborne diseases (World Bank 2003; ROY 2002a; ROY MWE 2004). The Constitution provides that surface and groundwater resources are communal property. Yemen’s Water Law No. 33 was ratified in 2002. The law promotes the sustainable use of water, protects water resources from overexploitation, and balances the water needs of the various communities and sectors. The law has been under reformulation since its enactment and does not appear to be enforced (ROY 1994; FAO 2008; ARD 2004). As a practical matter, Islamic and customary principles of water management govern in most of Yemen. These principles hold that: (1) water is an ownerless resource that can be appropriated by those who develop the resource (e.g., sinking a well); (2) upstream riparians have priority; (3) water cannot be alienated from the land; (4) wells must be spaced a certain distance; and (5) no one can deny drinking water to another person (World Bank 2007; ROY 2002a). Landowners have rights to surface and ground water. Landowners with financial resources can create deep tube wells on their land and sell the water extracted from deep aquifers to neighbors and remote purchasers. Landowners with spring-irrigated land can divert the water, creating a “turn” in the natural flow of water for their use or for resale (FAO 2008). In many areas of the country, new technology (enabling the diversion of larger quantities of water upstream, thereby denying downstream users altogether, or uncontrolled drilling that depletes groundwater reserves) has increasingly undermined traditional principles of water management and water management systems, resulting in inequitable distribution of water. In some areas, local traditional systems of dispute resolution are less effective because traditional leaders who serve as mediators and adjudicators lack neutrality or the perception of neutrality. Traditional leaders in some areas have become large commercial farmers and are themselves significant consumers of groundwater (World Bank 2007; ROY 2002a). Rural women and children pay the price for the increasing scarcity of water in Yemen. Trucked water commands high fees that are beyond the means of poor families. Women and children travel long distances, often at night, to fetch water from distant wells (World Bank 2007). The Ministry of Water and Environment (MWE) was established in 2003 and is legislatively responsible for water resource planning and monitoring, drafting legislation, and building public awareness. In practice the Ministry’s authority extends only to urban areas. Subsectors of the Ministry include the National Water Resources Authority (NWASA), General Rural Water Authority, and Environmental Protection Authority. The Ministry of Local Administration is responsible for water supply and sanitation in rural areas. The Ministry of Agriculture and Irrigation is responsible for policies on irrigation, crops, livestock, and forestry (FAO 2008; Al-Asbahi 2005). Yemen’s National Water Strategy (1999) and National Irrigation Strategy (2001) include plans for ensuring the sustainability of the country’s water resources, increasing the productivity of irrigated agricultural land, and reducing governmental involvement and relying more on user groups to manage the resource (FAO 2008). The World Bank, GTZ, USAID, UNDP, the Netherlands, and other donors have begun a US $90 million five-year (2009–2014) grant project to support the government’s implementation of the National Water Sector Strategy and Investment Program to: (1) strengthen institutions for sustainable water resources management; (2) improve community based water resource management; (3) increase access to water supply and sanitation services; (4) increase returns to water use in agriculture; and (5) stabilize and reduce groundwater extraction for agricultural use in critical water basins (World Bank 2009c). Roughly 1% of Yemen’s total land area is classified as forest. Most forest land is found in the western and southwestern escarpment and the coastal plains. Forest land is primarily savanna and scrub woodlands, with trees averaging 3 meters or less. Natural forests are located at Jabel Bura’ in the west, Houf in the east, and on the island of Socotra. Wadi bottoms host a variety of trees, and mangroves and Tihoma woodlands can be found in the coastal plains (Herzog 1998; FAO 2010; Ma 2008). Yemen has about 40,000 hectares devoted to agroforestry. Farmers plant trees around their farms, adjacent to watercourses, and on terraces. From the 1960s to the 1990s, various projects funded the establishment of greenbelts around urban areas and the development of plantations to secure sand dunes (Ma 2008). The Socotra Archipelago, which includes 3733 square kilometers of islands, has been classified as a protected area and a biodiversity hot spot. Thirty-four percent of the vegetation and seven mammal species on Socotra Island are endemic. The prized dragon’s blood trees are scattered over the islands and used for fodder, resin, honey, and decorative arts. The Hawf Protected Area in southeast Yemen consists of 90,000 hectares of rich forest vegetation. Yemen’s Buraa Forest, an undisturbed valley woodland, has been nominated as a World Heritage Site (Herzog 1998; FAO 2010; Ma 2008). Yemen’s forest dwellers and those living adjacent to forests are the lowest income group in Yemen. Their livelihoods are precarious, and the country’s forests are a critical resource. Forests provide people with food, medicinal and aromatic plants, shade for animals, and income-generating products such as honey and raw materials for charcoal production. Forests provide wood that supplies 70% of the country’s energy needs and between 50% and 60% of fodder for livestock. The demand for fuel and fodder exceeds the regeneration capacities of Yemen’s remaining forests. Yemen relies on imports of wood for its construction needs (FAO 2010; Ma 2008). Yemen does not have a national forest policy or legislation governing forest land. The last draft law, produced in the 1990’s, had as its objectives: (1) forest protection and preservation; (2) development of the forest and forest resources; (3) management and regulation of forests; (4) erosion and desertification control; and (5) contribution of forests to the national economy (Ma 2008; ROY MWE 2004). An estimated 80% of Yemen’s forest land is private land, although the locations and boundaries of the areas are questioned because there are no surveys or maps, and no law defines forest land classifications. The extent to which Yemen’s formal land laws apply to forest land in the absence of a forest law is unknown. The limited literature addressing Yemen’s forests offer no insight on the application of formal law to forest land. Under the customary law of Yemeni tribes, people living in or near forests have the right to use the forest for wood, grazing, hunting, and fruit gathering. Shaikhs and other traditional leaders have some authority over forest land and the use of forest products. However, details about the nature and extent of the authority and control are unreported (Ma 2008; Herzog 1998). The Ministry of Agriculture and Irrigation is responsible for policies on irrigation, crops, livestock, and forestry. The General Directorate of Forestry and Desertification Control, which is within the Ministry of Agriculture and Irrigation, was established in 1984 with the help of the FAO and other donor agencies. The Directorate is responsible for forest supervision, formulation of forest policies and strategies, implementation of forest campaigns, and desertification control. In the past, the Directorate was active in establishing plantations, water preservation projects, nurseries, and non-timber forest product development. Financial constraints have reduced the Directorate’s activities; the office receives only 1% of the Ministry’s budget and many donor projects from the 1980s and 1990s ended (FAO 2008; Ma 2008). The World Bank and Global Environment Facility (GEF) have supported the government in its efforts to protect the Jabal (Mount) Bura’a and the Hawf Forest zones. The project conducted biodiversity surveys, developed management plans for the areas, created an institutional framework supporting protected areas, and prepared natural habitat management maps (ROY MWE 2004). Yemen’s forest resource work has been almost entirely donor-funded. Both the government and the donors recognize that the government needs to take the lead in managing natural resources, rather than relying on donor projects. As of last reports, however, the government had not supplied the necessary funding (Ma 2008). Over the last two decades, several donors (including UNDP, the FAO, the World Bank, Switzerland, and the Netherlands) have supported various forest land related projects, including technical assistance with the legislative framework and the development of forest plantations for purposes of sand dune fixation, greenbelts, and windbreaks. The FAO helped the government establish 53 nurseries to assist in the production of tree seedlings for reforestation. The nurseries were publicly owned and operated by the Forestry Department. However, the government did not have funds to continue the project after the donor funds were exhausted, and most of the nurseries have closed (ROY MWE 2004; Ma 2008; Herzog 1998). Yemen has reserves of oil, gas, cobalt, copper, gold, iron ore, nickel, and zinc, and industrial minerals such as limestone and gypsum. Most of the country’s mineral production is focused on the production of oil, gas, and limestone for cement plants. Yemen has three main cement factories: Bajil Cement Factory (producing 250,000 tons annually), Amran Cement Factory (producing 500,000 tons annually), and Al-Burg (producing 500,000 tons annually). Recent exploration for gold has taken place in the Wadi-Madda, Wadi Sharis, and Ahim-Washah areas (Mobbs 2007; Saeed 2010; Mbendi 2010). Oil was discovered in Yemen during the late 1980s. Oil income provides an estimated 75% of government revenue and 90% of export revenues. At the current rate of extraction and absent any new discoveries, the country will deplete its oil reserves by 2012 (World Bank 2007). Under the Constitution, mineral and energy resources are owned by the state. The Mines and Quarries Law No. 24 of 2002 governs metal and industrial mineral exploration and production operations and provides broad exceptions for minerals subject to special agreement or pre-existing ownership rights. The Mines and Quarries Law sets the terms for mineral exploration, extraction, and production operations (ROY 1994; ROY 2002b; Mobbs 2007). The Mines and Quarries Law provides that the state can grant licenses to persons and entities for the exploration and extraction of mineral resources. Foreign and domestic companies can obtain licenses. Under the Mines and Quarries Law, individuals who discover minerals but fail to extract them in accordance with their license lose their extraction rights. If a licensee violates the terms of the license, the licensee will be subject to fines and loss of the license. The Yemeni government is in the process of revising the legal framework governing the mining sector. A new mining law and policy is expected in 2010 (IFC 2009; Mobbs 2007). The Ministry of Oil and Minerals manages the minerals sector, with the Geological Survey and Minerals Resources Board supervising solid mineral activity. The Petroleum Exploration and Production Authority is responsible for natural gas and petroleum exploration and production. Oil projects are governed by production- sharing agreements (Mobbs 2007). Yemen’s economic future has been highly dependent on its declining oil resources. As the price of oil dropped and its reserves diminished, the government has adopted an economic reform program designed to support non-oil sectors (Embassy of Yemen 2006; ROY 2002). Since 2006, the International Finance Corporation (IFC) has been assisting the Yemeni government in drafting a new mining law, policy, and regulations. The new legal framework is expected to reflect best practices, including environmental practices, increase transparency, efficiency, and regulatory accountability, and streamline administrative procedures faced by investors. The project’s objective is to increase the effectiveness of the Geological Survey and Minerals Resources Board as a regulator, increase the attractiveness of Yemen to foreign investors, and develop the industry for the social and economic benefit of the population (IFC 2009). International donors, including the World Bank, the governments of Belgium, Denmark, the United States, and the United Nations have pledged US $5 billion for development projects designed to fill the gap created by dwindling oil revenue, including a liquefied natural gas facility opening in 2009. The project has provided the government with analysis of policy options, regulatory regimes, options for support of private sector, institutional design, and analysis of possible barriers and options for addressing barriers to the development of alternatives to the oil industry (Embassy of Yemen 2006; ROY 2002; ESMAP 2007).